Frenchies are now one of the most popular dogs in the world. But if you’re considering bringing a Frenchie into your family, it’s important to know the pros and cons of owning this particular breed, before diving in head first. The French Bulldog sports bat-like ears, wide eyes, and a short, stocky stature that makes pet owners fall in love with their overall cuteness. However, Frenchies have more to offer potential pet owners than just their looks. From their overall temperament to their adaptability, these dogs have many pros that pet owners will enjoy. While Frenchies tend to make all types of noises like snorting, grunting, snoring, and talking, they don’t bark as much as other small breed dogs. Just like any other breed, they do bark under certain circumstances such as being introduced to a stranger, being scared, etc, but it’s much less than other breeds. For centuries, French Bulldogs have made great companion dogs, with their friendly demeanor that’s suitable for a single person or families with children. These loving dogs are usually well-behaved around other animals and visitors, often looking for an open lap to cuddle on. Being a smaller breed dog, they’re easy to handle and adjust to change quicker than other breeds. These dogs have an even balance between lounging around and enjoying playful interaction with their family members. Unlike many breeds, the Frenchie features a short, silky coat that requires minimal grooming to keep their coat healthy. A quick brush helps remove loose hair and distribute natural oils evenly across the coat, maintaining its natural shine. Since they have a shorter coat, Frenchies tend to shed less than breeds with longer hair and brushing them regularly helps decrease the amount of hair shed. If you’re looking for a breed of dog that doesn’t need a lot of exercise to stay healthy, the French Bulldog’s an ideal choice. They prefer to snuggle with their owner or relax on the couch, making a brisk walk once or twice a day sufficient enough to keep them healthy. You can also play a game of fetch a couple of times per week for exercise as Frenchies love to chase balls and play with toys. Aside from the long list of positive attributes a French Bulldog offers, they do have some disadvantages that could turn potential pet owners away. It’s important to know both the pros and the cons of owning a Frenchie, to know if they’re a suitable pet for you and your family. One of the biggest downfalls to owning a French Bulldog revolves around their health. Like other flat-faced breeds, their short snout makes them prone to breathing issues and unable to cool themselves down during hot or humid temperatures. It’s very important to avoid strenuous activity during hot weather and avoid constricting collars or leashes that could trigger breathing problems. In addition, Frenchies are known to suffer from several eye conditions including cherry eye, entropion, and juvenile cataracts and auto-immune disorders. 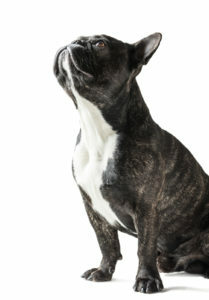 Some Frenchies develop skin allergies, while others develop food allergies that require them to need a special, more expensive brand of dog food. Many different breeds of dog have a tendency to drool, the Frenchie is no exception. Having a short snout and flat-face makes it hard for them to cool down, the drooling seen in Frenchies is their way of lowering their body temperature when they overheat. Plus, Frenchies have fat, loose lips that make them prone to drooling and slopping water on the floor after getting a drink. While it’s not as excessive as other breeds, many pet owners prefer a pup with less drool. Owning such a loveable dog like a Frenchie doesn’t come cheap. To buy one of these pups from a reputable breeder could cost you anywhere from $1,400 to upwards of $8,500. However, you should also consider the cost of purchasing food, vaccinations, grooming supplies, and the cost of veterinary care if your Frenchie suffers from any type of health condition. Despite they’re overall pleasant temperament, some French Bulldogs have a stubborn personality. This can make it hard to teach them basic commands, potty training, or leash training. Pet owners will need to use patience and persistence to properly train their dog or seek help from a professional trainer. Should You Get a French Bulldog? Considering the cons associated with owning a French Bulldog and it’s vulnerability to several health conditions, it may seem like owning a Frenchie isn’t worth it. However, with proper care and some prevention measures, the pros of owning such an adoring breed outweigh the cons.